PALEO JAY SMOOTHIE CAFE: PaleoJay Podcast #20- Exercise LESS and Eat MORE! To Diet properly, eat a LOT of food! To Exercise properly, do a LITTLE! I know, it seems counter-intuitive to say the least- eat LOTS of food to lose weight, i.e. FAT- but it’s true! The idea of counting calories and eating smaller portions and using lots of will power is...just.....WRONG! Just like the idea that eating fat makes you fat is...wrong! Flat out, no question about it, completely WRONG! In fact, FAT, as in real, honest-to-God natural FAT as in pastured butter, coconut oil, avocados, and fat from pastured animals is your SECRET WEAPON in staying on a healthy, FAT LOSS type of diet! The reason is satiety- eat enough real, natural fat along with your other real foods and you will never, ever be hungry- honest! So, why eat a lot of food to lose weight? The key is to eat the right foods- natural, God made foods- these foods, that we are designed to consume, will never make us fat. They are real food, food that will sustain us, and give us all of the nutrients that we need to be happy, healthy human animals. Grass fed meats, wild caught seafood, organic vegetables without loads of pesticides, grown on healthy soil, quality teas and organic coffee, dark chocolate with minimum sweeteners, pastured pork and poultry, fruits - keeping them within their natural season is best! It all makes perfect common sense when you think about it, doesn’t it? Man made food-like substances, loaded with chemicals, highly processed and loaded with artificial trans-fats and even artificial sugars- how could ANY of that be healthy for us? No wonder Jabba the Hut is the representative man of the future in Star Wars! And, for a great movie predicting the future, check out WALL-E. It’s been out a few years, since 2008,but is very readily available as it is a WD and Pixar movie. The premise is about how all of humanity now lives in little carts they drive around in, and they are obese and unable to walk and eat and drink artificial drinks in big cups on their carts all day long... you get the idea. We are perilously close to getting to this state as a culture! Don’t you go along with this horrible trend- eat REAL food! 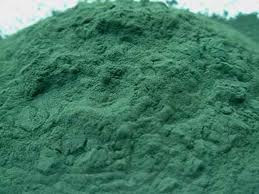 And don’t forget the Spirulina in your Paleo Smoothie! Less is definitely more with exercise. The key is intensity- long, slow, mindless jogging or other aerobic activities does more to tear you down than to build you up, and if done daily over a long period, it can destroy your joints, make your muscles WEAKER, and actually put such stress on your system (particularly by loading your body with cortisol, the stress hormone), that you become more, not less prone to major diseases like cancer and heart disease. The ideal is restorative exercise! I just got back from a couple of long days of moving an elderly relative into assisted living. I pretty much loaded up all of his worldly goods into a trailer and other vehicles, with help I might add, but still, it was quite a workout... but it was a workout like a chronic cardio or weight lifting session- long, endless from early morning to late night, with hardly time to eat at all, and quite a bit of stress from being away from home in a hotel, not enough sleep, and what meals we could get were like store eggs (not pastured), cooked in vegetable oil I’m sure, and lousy bacon from a micro-wave. As an aside, I will mention here the irony of this situation: we were moving this person from a town in the heart of America’s farm belt- the entire area is perhaps the richest farmland in the world- and the only food available for the locals was the worst, most depleted and most fake foods you could think of, in both restaurant and store. And what is this incredibly rich farmland being used to produce? The most Restorative Exercise you can do is Virtual Exercise- just Flexing the muscles throughout their range of motion for 5-10 repetitions, and then holding them in an isometric flex for a few seconds at the end! I go into this in great detail in my eBook Perfectly Paleo Exercise, but there is also lots of information you can find at paleojay.com. Also, John Peterson and transformetrics.com has a great tutorial on this subject- he calls the exercises Tiger Stretch exercises. Whatever you call it, it is truly Restorative Exercise! This is the one form of exercise everyone should do, every single day! It rejuvenates you, builds the muscles and restores the functioning of the joints, and will NOT injure you as it builds you. And for pure aesthetics, meaning for a physique, man or woman, that will be the best LOOKING one possible for your own body type- there is no exercise that can compete! You can do it in front of the television, easily, and combine productive exercise with pleasure and instruction. There really is nothing else like it in the field of physical culture!